Curved bands of color formed by rhythmic crystallization of quartz within volcanic rocks are the distinguishing characteristic of agates. The ancient Egyptians believed that agates protected the wearer from lightning, bestowed the power of oratory, and quenched thirst. Among the distinctive varieties used by Murphy Design are spotted and striped agates, delicate "blue lace" agates, and "moss agates," which are actually a closely related quartz named for their mosslike (not banded, and therefore technically not agate) patterns. Protect all gemstones from scratches, blows, and extremes of heat and cold. Amethyst, the most highly valued member of the quartz family, ranges in color from a delicate violet to a deep, royal purple. Amethysts abound in ancient Greek and Egyptian ornaments and in the British crown jewels. The ancient Greeks believed that wearing an amethyst or drinking from an amethyst chalice would prevent intoxication. Amethyst was also associated in ancient times with protection, peace, tranquility, piety, spiritual wisdom, humility, sincerity, and contentment. Amethyst is a tough stone that you can wear every day with little fear of harming it. Aquamarine--Latin for "water of the sea"--is rich in ancient lore. It was said to possess the calming effects of the sea, to aid those who travel by water, to help establish happy marriages, to protect newborn babies, to bestow insight and foresight, and to induce sleep. The aquamarine is a universal symbol of youth, hope, and health. A 243-pound aquamarine crystal, blue on the inside and green on the outside, was found in Brazil in 1920; the American Museum of Natural History in New York City has a 13-pound piece of the green outside portion. Another famous Brazilian aquamarine was given to American First Lady Eleanor Roosevelt by the Brazilian government and is now in the Hyde Park Museum in New York City. Azurite, named for its azure blue color, often occurs with malachite in or near copper deposits. Malachite is a rich green stone that was mined as early as 4000 B.C. by the ancient Egyptians, who attached it to children's cradles to drive away evil spirits. The Egyptians, Greeks, and Romans used it in jewelry and, in powdered form, as eye shadow. Much later, the Russian czars used malachite from the Ural Mountains as wall paneling and inlay to decorate their palaces. It symbolizes eternal spring and is said to protect its owner from lightning. Malachite's bands and whorls embedded in deep blue azurite create a miniature landscape of great beauty. Protect it from blows, scratches, household chemicals, and extremes of heat and cold--and don't use an ultrasonic cleaner. Carnelian is a red-orange member of the quartz family. It is known to virtually all ancient cultures in the West, Asia, Middle East, and pre-Columbian America. Carnelian has a prominent place in the jewelry and other treasures fond in King tutankhamen's tomb. Many fine carnelian ring stones carved by ancient Romans also have survived. A stone rich in legend, carnelian was said to strengthen creativity, prosperity, ambition, and curiosity; balance body energies; soften anger; and promote focusing on and achieving goals. Chalcedony is both a general term for translucent quartzes and specifically the name of a bluish gray quartz. In ancient times chalcedony was used for cameos and as a talisman against idiocy and depression. The name is derived from Chalcedon, an ancient seaport in Asia Minor near Byzantium, a probable early source of chalcedony. Pliny records that partially transparent chalcedony was used for observing eclipses of the sun. Among the other, structurally similar, quartzes described by the general term chalcedony are agate, chrysoprase, jasper, and chrysocolla quartz. Chrysocolla, which is very rare, takes its intense color from its copper content (as turquoise also does). In modern lore, chrysocolla is sometimes called gem silica and is said to have a calming effect and therefore to be beneficial to those who suffer from emotional stress. Alone, chrysocolla is quite soft, but when it is mixed with quartz it becomes considerably more durable. Protect chrysocolla (and all gemstones) from scratches, blows, household chemicals, and extremes of heat and cold. Chrysoprase (from the Greek meaning "golden green") is a quartz once associated with mines in Poland; it was used to decorate a chapel in Czechoslovakia and a castle in Germany. Legend has it that Alexander the Great wore a chrysoprase during all of his battles until, after his Indian campaign, he took it off to bathe in the Euphrates River and a serpent dropped it in the river. Chrysoprase traditionally symbolizes happiness, enterprise, and prudence; in modern lore it is said to balance physical, mental, and emotional well-being. 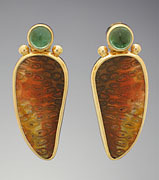 Much of the world's chrysoprase now comes from Australia and from Arizona, California, and Oregon in the United States. Citrine, a member of the quartz family of gemstones, ranges in color from sunny yellows to a tawny golden brown. Its name is derived from the French word for lemon: citron. People once carried citrine to protect them from the plague, evil thoughts, and snake bites. In modern lore, it is said to expand consciousness and promote mental clarity. Found mainly in Brazil, citrine is a durable stone that holds up well to being worn every day. Diamond, the hardest gemstone, is carbon formed 50 miles or more within the earth at high temperatures and under great pressure. Its name comes from the Greek adamas, unconquerable. India was the world's first source of diamonds, which were introduced to the western world when a traveling Frenchman brought a diamond back to France in 1605. Many of the world's diamonds now come from mines in Siberia, Africa, and Australia. An enterprising Texan once "mined" diamonds from the ocean bottom with the equivalent of a huge vacuum cleaner. Drusy quartz is found lining the pockets inside geodes. Its rough surface of tiny reflecting crystals takes on the color of the materials it forms on: chrysocolla (a bright blue), rhodochrosite (rosy red), psilomelane (black), blue lace agate (a delicate blue), and fossilized coral are a few. Protect drusy--and all gemstones--from scratches, blows, and extremes of heat and cold. Emeralds have long been associated with Colombia, where they were mined by the Incas; some of the deposits found by the Incas are still being mined today. Ancient legend has it that emeralds make the wearer more intelligent and more honest, cure poor eyesight, and bestow the power to predict the future. Tiny crystals trapped in emerald form what is known to experts as a "garden" that can be seen only under magnification. Garnet is a large family of gems that are found in every color except blue. Noah is said to have hung a garnet in the ark for light, and tradition credits garnet with protecting its owner from nightmares. Garnet crystals reminded early scientists of pomegranate seeds: The name garnet comes from the Latin granatus (seedlike). Pyrope (red with a brown tint), almandine (red with a violet tint), and rhodolite (a rosy or violet red) are three varieties that have associated garnet with red. Tsavorite is a recently discovered green garnet found in Tanzania that was named by Tiffany and Company for Tsavo Park in neighboring Kenya. Protect garnets from scratches, blows, and extremes of heat and cold--and don't use an ultrasonic cleaner. Garnets are found in all colors except blue. The rhodolite garnet is red, named when stones the color of rhododendron flowers were discovered in 1898 on the east coast of the United States, in North Carolina. East Africa and Sri Lanka are now the principal sources of rhodolite garnet. Garnet is rich in associations from ancient times, when it was thought to protect its owner from nightmares and from poison. In Christian tradition, the blood-red garnet is symbolic of Christ's sacrifice; in the Muslim Koran, garnet illuminates the Fourth Heaven. Iolite is sometimes called (poetically but incorrectly) "water sapphire"--and indeed its blue-violet color is reminiscent of sparkling water and glittering sapphires. It is most often found in the form of water-worn pebbles. In legend it is the stone of friendship. Viking seafarers used thin slices of iolite to polarize light, allowing them to determine the exact position of the sun on overcast days. Iolite is found mainly in East Africa and India. Protect iolite from scratches, blows, and extremes of heat and cold--and don't use an ultrasonic cleaner. Jade is a collective name for two minerals, jadeite and nephrite. Prehistoric peoples made tools and weapons out of nephrite, which is very tough. Jadeite is more common for jewelry. The last empress of China so loved jade that she turned away a visitor offering a fabulous diamond tiara but welcomed one who brought a small jade object. A traditional symbol of the five cardinal virtues of charity, modesty, courage, justice, and wisdom, jade occurs in many colors, but the most sought-after is imperial jade, an emerald green translucent jadeite from Burma. Protect jade from cosmetics and household chemicals, including jewelry cleaners--and don't use an ultrasonic cleaner. Jasper is a member of the quartz family that contains significant amounts of other materials. These materials give jasper its patterns and colors (reds, pinks, greens, and browns), and it is often named informally for its color or for the place where it is found. Two varieties from Idaho are Bruneau jasper--earthy tones from the Bruneau River canyon--and Willow Creek jasper, usually a rosy pink. Engraved jasper rings found at Pompeii and Herculaneum demonstrate that the ancient Romans, too, adorned themselves with jasper. Lapis lazuli is a deep, rich blue. Cleopatra used it in powdered form as eyeshadow, and ancient conquerors bragging about their booty often mentioned lapis before gold and other riches they had captured. During the Middle Ages, lapis was used to make ultramarine pigment, which was so expensive that it was considered a mark of wealth to commission a painting that required ultramarine. Lapis has been used to make vases, bowls, ornamental carvings, and mosaics as well as jewelry. Catherine the Great used it to decorate her favorite room in the Russian royal palace. Protect lapis from cosmetics and household chemicals, including jewelry cleaners--and don't use an ultrasonic cleaner. Moonstone is a feldspar that gets its milky sheen from refraction of light by its thin internal layers. It is found in Sri Lanka, Burma, Madagascar, Australia, Brazil, India, Tanzania, and the United States. Onyx is a member of the chalcedony group of quartzes. Most people associate onyx with the banded, translucent stone that is often carved in to cameos and other objects. Black onyx, which is very popular in in fine jewelry, is a dyed version of that stone. The art of dying was known to the ancient Romans, and it has been practiced in Idar-Oberstein, Germany (the most famous stone-cutting center in the world) since the early 19th century. Black onyx fills a void left by nature: Black gemstones are not common. The ancient Arabs believed that opal fell to the earth in a flash of lightning, but in fact opals get their mysterious iridescence from light striking an internal structure of microscopic spheres. White opal is a light, delicate color; black opal is dark blue, black, or green, with vivid flashes of intense colors. The Empress Josephine, wife of Napoleon, owned an opal called "The Burning of Troy"; Queen Victoria gave each of her five daughters a magnificent opal. Australia is the primary source of the world's opal. Protect your opal from scratches, blows, and chemicals, including jewelry cleaners. Abalone mabe pearls are the world's rarest pearls. They are very difficult to cultivate and will not tolerate polluted waters. There are few Abalone beds in the world and most suffer from pollution. The frigid waters off the coast of New Zealand are the exception, they offer pristine conditions and produce the most colorful, lustrous, and rarest pearls in the world. In ancient times, it was believed that a drop of dew falling into an open mollusk resulted in a pearl; now we know that a more prosaic--though equally organic--irritant causes a pearl to grow, and that knowledge is used by pearl "farmers." Cultured pearls--those cultivated by humans, though still produced by mollusks--account for most of the pearls on the market today. The Chinese paved the way for cultured pearls in the 13th century, when they inserted tiny Buddha figures in mollusks so that the figures would be covered with pearl. Japan and China are the primary sources of cultured pearls, although the United States has a growing pearl farming industry and continues to supply the mollusk shells from which most seeding materials are made. Protect pearls from cosmetics and other household chemicals, and don't use an ultrasonic cleaner. Believe it or not, the fabled emeralds of Queen Cleopatra may really have been peridots mined on a Red Sea island off the coast of Egypt. Indeed, many emerald afficionados of antiquity may also have been peridot lovers without knowing it. Peridot is the August birthstone. Rose quartz is a delicate pastel pink. When it is cut in cabochon style (rounded rather than faceted), a six-rayed star, created by needles of rutile held in the quartz, sometimes appears. Legends say that rose quartz will bring its wearer love. The ancient Greeks believed that colorless, transparent quartz was ice in permanent form. Quartz is an old German mining term that has been used in many languages since the 16th century. Brazil and Madagascar supply most of the world's rose quartz. Rutilated quartz holds golden streaks of titanium. One stone may display a sunburst, another a sheaf of wheat. Rutile, from the Latin rutilus, "reddish," is the principal ore of titanium. Tourminalated quartz is peppered with tiny swatches and needles of black tourmaline. Each of these stones is truly unique. Ancient legend said that ruby, a symbol of love and immortality, reconciled quarreling lovers and cured illness. The Hindus believed that its deep red color came from an inextinguishable fire. Marble is the most common ruby-bearing rock. Famous rubies are on display at the British Museum of Natural History in London, the Smithsonian Institute in Washington, D.C., and the American Museum of Natural History in New York City. According to ancient lore. Sapphires attract divine favor for their owners. Another legend says that a giant sapphire gave the sky its color. Not all sapphires are blue, though: yellow, pink, and orange are among its other colors. In the 12th century, the Bishop of Rennes, who loved sapphire, began to use it in church regalia. Sugilite was introduced in the United States in 1984. It was first found in 1944 in Japan by Professor Ken-icihi Sugi, for whom it is named, but it wasn't used in jewelry until a huge deposit was discovered--by accident, in a manganese mine--in the Kalahari Desert in South Africa in the 1970s. Bands and flowerlike patterns often adorn the royal purple stone, which is beautiful in combination with virtually all other colors, including reds, blues, and greens. Protect sugilite from cosmetics and household chemicals, including jewelry cleaners, and don't use an ultrasonic cleaner. Tanzanite, a rich, royal blue that also flashes purple, is among the rarest of gems: its only source is Tanzania, where it was discovered quite recently. Tiffany and Company named it and introduced it to gem and jewelry lovers. Protect tanzanite from scratches, blows, and extremes of heat and cold--and don't use an ultrasonic cleaner. The powers once ascribed to topaz are as varied as the colors of the gem (yellow, pink, green, blue, brown, red): Topaz was said to drive away sadness, strengthen the intellect, bestow courage, dispel enchantment, cure asthma and other ills, confer cheerfulness, cool tempers, prevent bad dreams, relieve insomnia, ward off sudden death, change color in the presence of poison, and make the wearer invisible in times of emergency. A 15th-century physician is said to have cured plague victims by touching them with topaz once owned by Popes Clement VI and Gregory II. Protect topaz from scratches, blows, and extremes of heat and cold--and don't use an ultrasonic cleaner. Before tourmaline was identified in the late 18th century, it was mistaken for emerald, topaz, sapphire, and other stones. Not only is it found in a variety of vibrant colors, including green (chrome tourmaline), blue (indicolite) and red, a single stone may show two or more colors. A remarkable multicolored stone called watermelon tourmaline--a pink and white center surrounded by a green rim--is often cut in slabs. California and Maine produce a lot of tourmaline, which stands up well to wear but should not be cleaned in an ultrasonic cleaner. Tsavorite is a newcomer to the gem kingdom, discovered during the late 1960s in East Africa, still its only known source. a member of the garnet family, this emerald look-alike was dubbed "tsavorite" (after the Tsavo Park in Kenya) by Tiffany's for the stones first national promotion in 1971. It is the birthstone for January. Turquoise was valued by most ancient civilizations, including the Aztecs, Incas, Persians, Egyptians, and the Indians of the southwestern United States. Because of this, there are more legends associated with turquoise than with any other gem. One holds that a piece of turquoise thrown into a river will bring rain. Another says that turquoise is found hidden at the foot of a rainbow. Turquoise's copper content is responsible for its color. Some stones, called matrix turquoise, contain spidery networks of the mother rock. Protect turquoise from cosmetics and household chemicals, including jewelry cleaners, and don't use an ultrasonic cleaner.